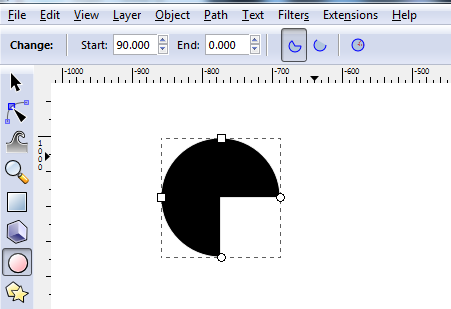 Drawing a three-quarter circle in Inkscape? I've been able to approximate a three-quarter circle in Inkscape using bezier curves, but is there a more precise way I can draw a three-quarter circle in Inkscape? Use the circle tool to control-drag a uniform circle and once created, double click to edit and change the start and end angles to 90 and 0 (or 360) as in the image below. If you want an outline, then add a stroke and remove the fill. Not the answer you're looking for? Browse other questions tagged inkscape shapes or ask your own question.